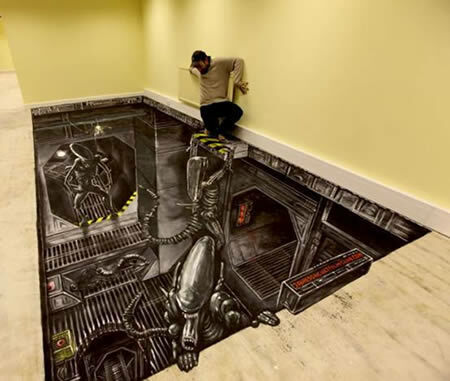 3D Street Art paintings have been around since the sixteenth century when Italian Renaissance Madonnari and French trompe l'oeil (French for ‘deceive the eye') painters created stunning murals to decorate the interior walls of luxurious villas. 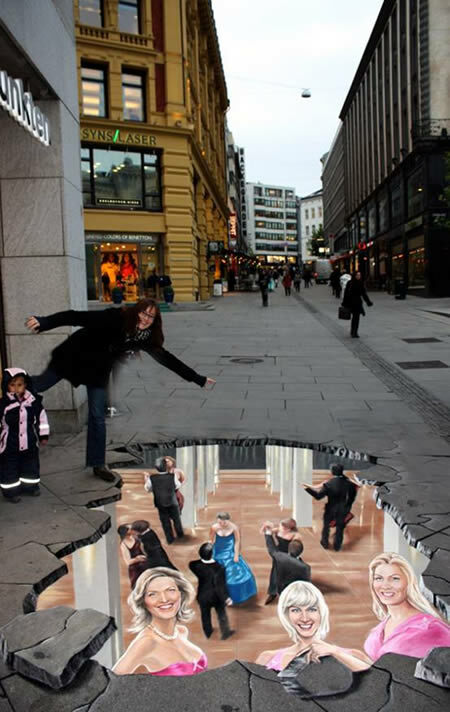 In the twenty first century 3D street art has become incredibly popular, fuelled by the internet's capability to distribute photographs around the world at lightning speed and the use of the art by brands to create innovations. Talk about subtle advertising! 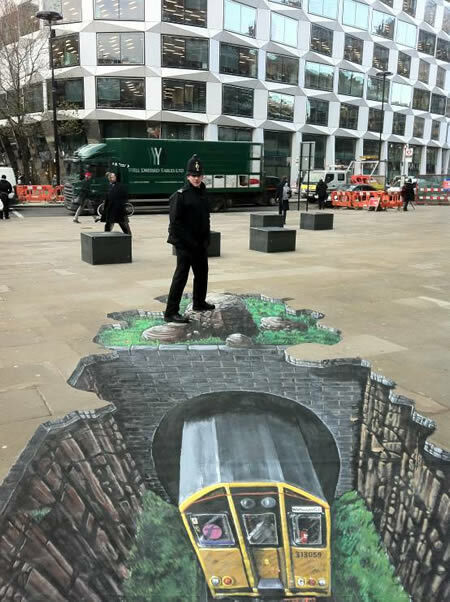 3D Street Artists have become famous for producing breathtaking designs and in this article – written by Kristian Jeffrey from Street Advertising Services, we are going to feature some of their latest and most awe-inspiring pictures. 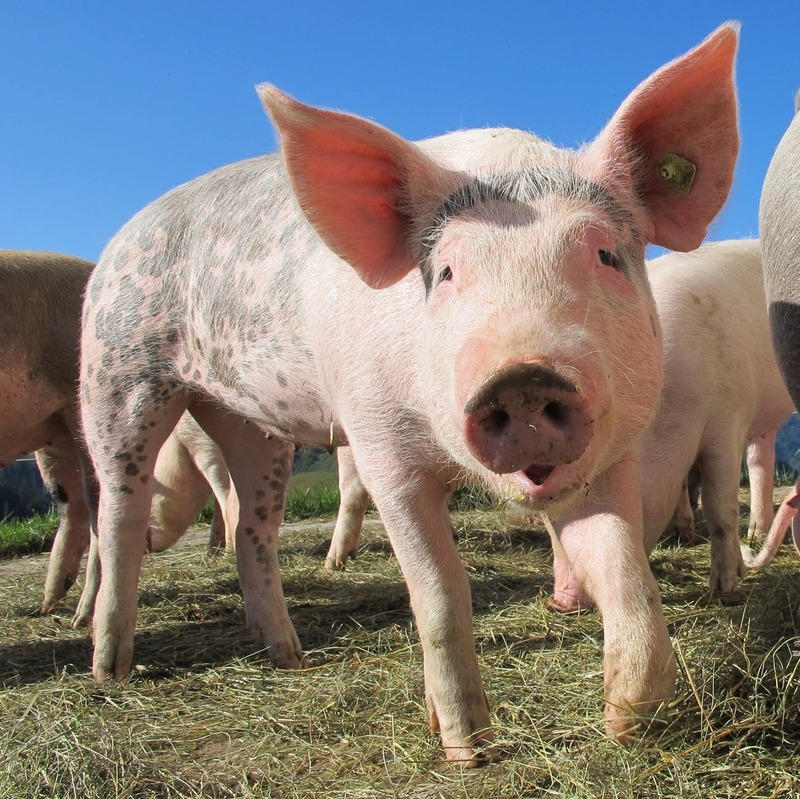 Third cave project in Ptuj, Slovenia, by Edgar Mueller. 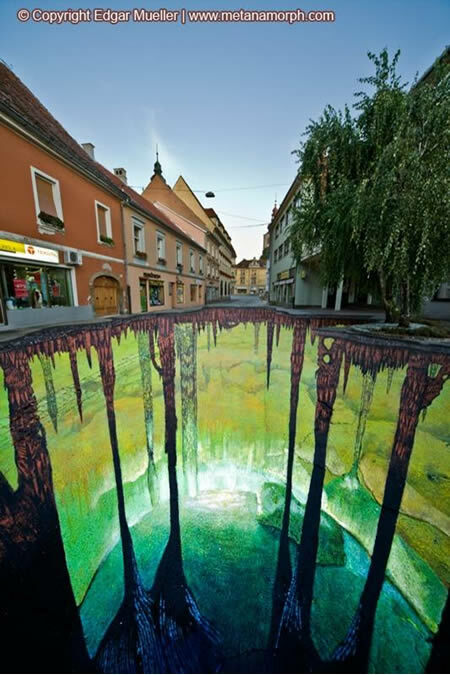 Mueller has created some of the most famous and instantly recognizable pieces of 3D Street Art including the street flowing with lava and the huge caves opened up beneath the ground. 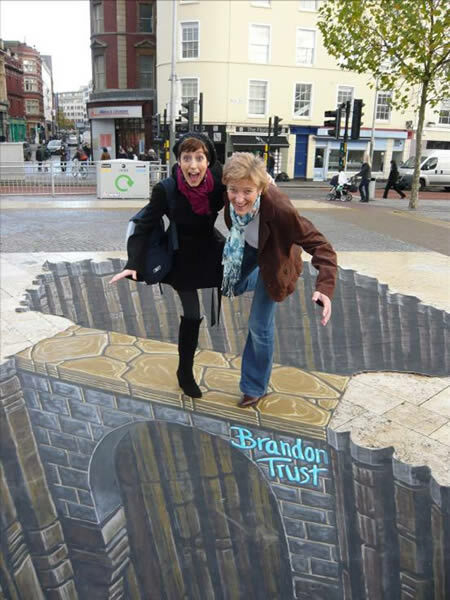 Brandon Trust bridge, Bristol, Street Advertising Services. Jameson's Cult Film Club, Liverpool, Street Advertising Services. Look carefully at how the fireman is climbing down into the real world. 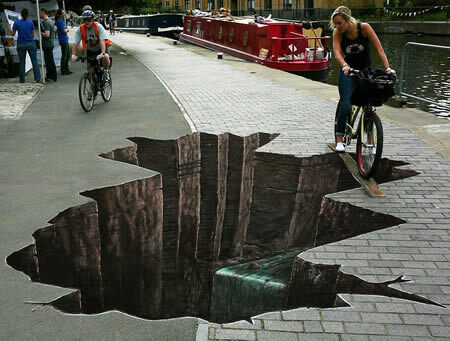 This piece called ‘Rescue', in London, was created by Julian Beever, the 46-year-old artist, who is based in Belgium and has spent most of the past 20 years painting with chalk to produce stunning 3D images which mix reality with fantasy to fool the eyes and trick the minds of passers-by. Shelterbox, London, Street Advertising Services. Anti-AIDS campaign, Oslo, by artist Manfred Stader. 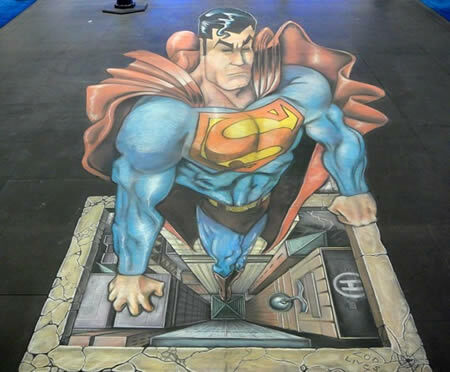 Stader began street painting and pavement art during his art studies at the famous Städel Artschool in Frankfurt, at the beginning of the 1980s and in 1985 he became one of the few master street painters. 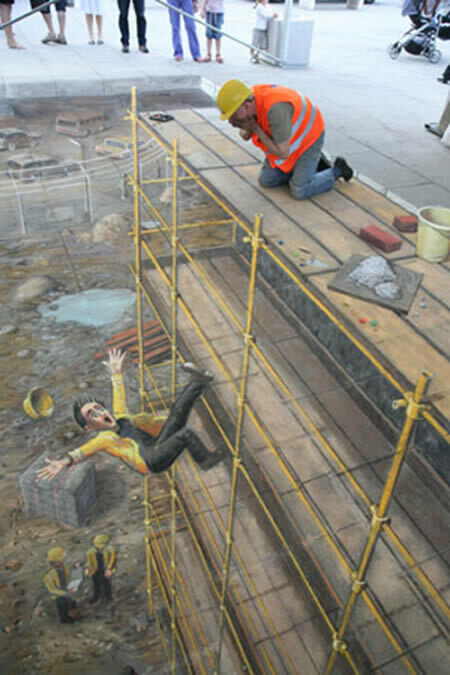 ‘Accident' Building site, Vienna, by Julian Beever. 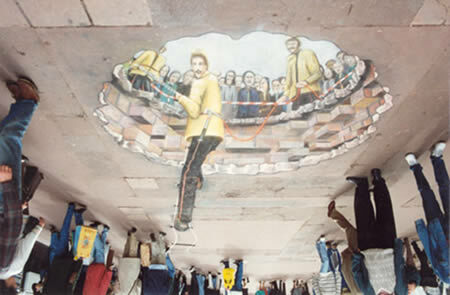 When viewed from certain angles, Beever's intricately detailed chalk sketches create a convincing impression of depth on the flat surface of paving stones. From other perspectives, however, his drawings appear strangely distorted and bear little resemblance to their intended image. 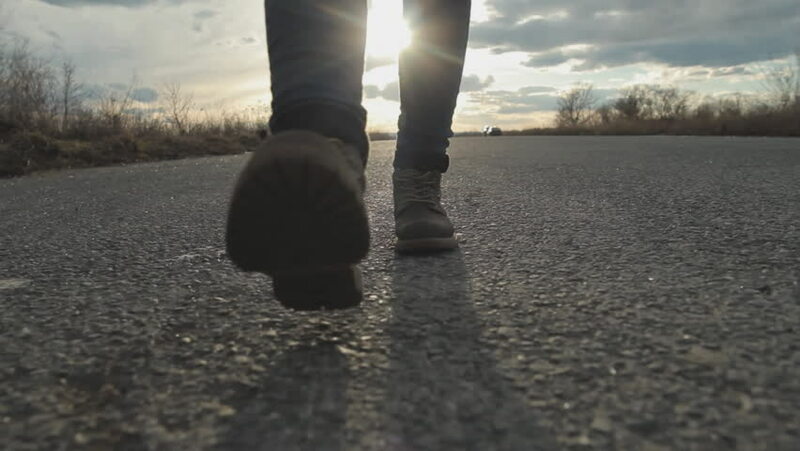 To construct his illusions, Beever, originally from Melton Mowbray in Leicestershire, uses a camera lens to help him manipulate the image on the flat surface to appear more realistic. ‘Lions Gate', China. This is the current World record holder for largest piece of 3D Street art ever, measuring an incredible 891.5 Square Metres. By Qi Xinghua. ‘Going underground', London, Street Advertising Services. 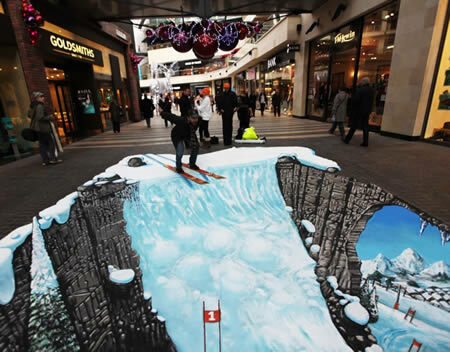 To create maximum publicity for their Winter destinations and ski resort flights‚ Easyjet tasked Street Advertising Services to draw something really special for their 3D pavement art. Here is the result... 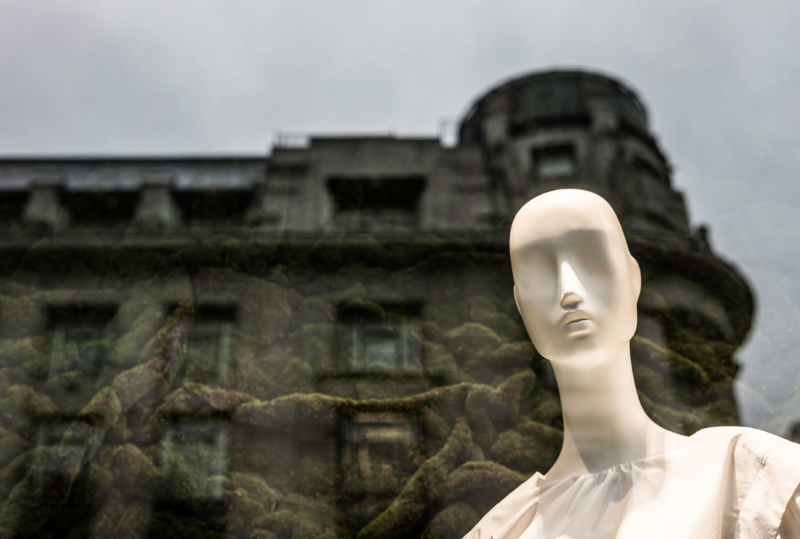 The pictures toured around three cities and malls and people loved to interact with the art. This huge sewer scene with a resident sewer monster was created for United Utilities to educate consumers on what not to flush down their toilet and sinks. 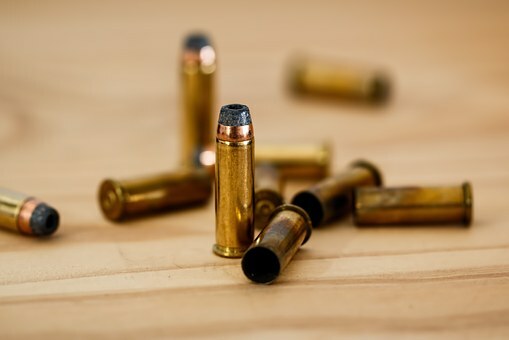 The story was used by local media and even made it onto BBC News! Swimming Pool, Lodz, Poland, by artist Manfred Stader. 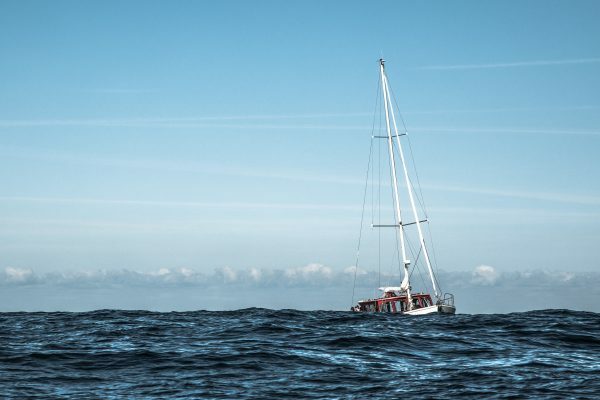 His deep swimming pool was so realistic that shoppers swerve to avoid it. 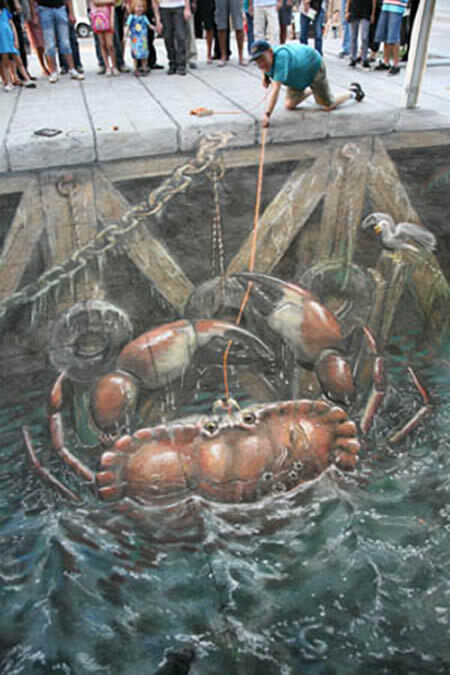 ‘Crab Catching', London, also by Julian Beever. Nick, Maddie, Greg, Joe, Max and Rich from Street Advertising Services are a collection of artists based in the UK. 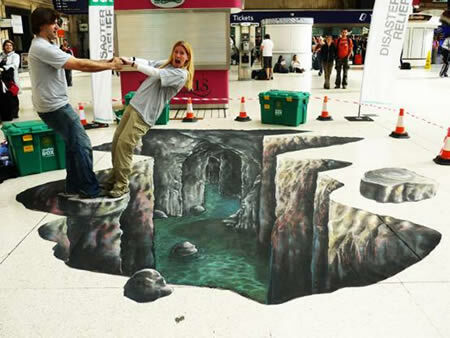 They started the business in 2006 although a few of the artists have been painting 3D Street art for over ten years. 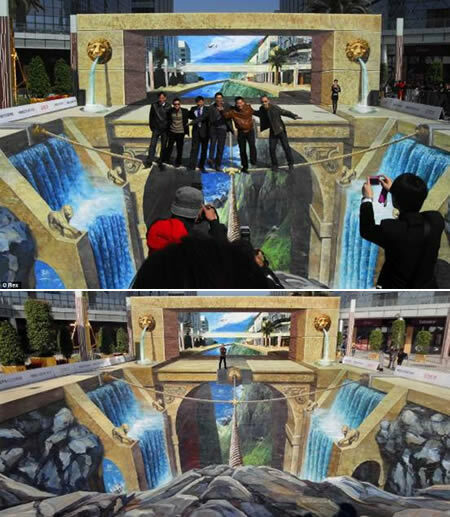 Since then, they have gone on to create spectacular 3D art all around the world. 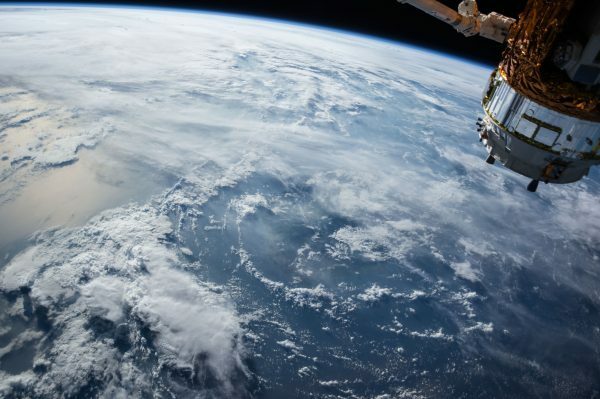 The most important aspect of their work is integration and entertainment of the public. 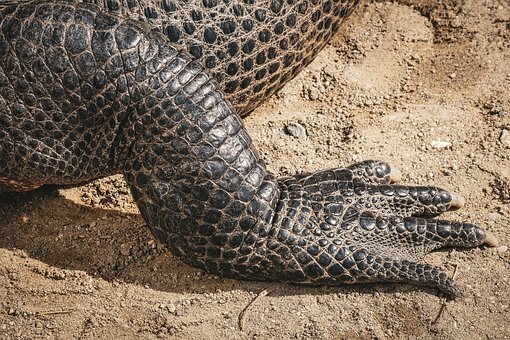 Their work is designed to astound and inform at the same time.